Southwest Wisconsin often boasts about the natural beauty of the region, the immense amount of agriculture, the hard work ethic of the people, and the home of two prominent educational systems in Fennimore and Platteville. As partners in education, Southwest Wisconsin Technical College has collaborated with the University of Wisconsin-Platteville, Kristin Mitchell Design, and Compounding Courage to host, You First, a conference developed from the Ladies Leadership series that will focus on building a network of resilient woman in southwest Wisconsin. Kim Schmelz, director of External Relations and Alumni Development for the Southwest Tech Foundation recently interviewed Julie Stephenson and Stacy Thousand, two of the women of Compounding Courage. They will lead a discussion at the You First Conference. 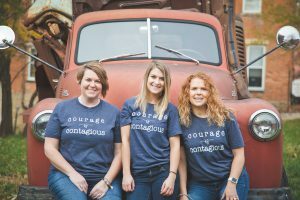 Schmelz wanted to learn about their Southwest Tech connection, how Compounding Courage got started and why building a network of resilient women in Southwest Wisconsin is so important to them. Stephenson and Thousand both attended Southwest Tech right out of high school. They were both looking for an option where they could earn a degree and get to work. Thousand talked about the experience of having non-traditional students in her class that had been laid off from Advanced Transformers and how that positively affected her experience. “You could tell for some that they felt this was their last chance to really start over and they were so determined. It gave me a greater perspective on my education.” Stephenson graduated with a degree in Early Childhood in 1997 and Thousand earned her degree in Marketing in 1999. Fast-forward 20 years and these two women, along with Dana Gevelinger have started Compounding Courage, a personal growth and leadership development company creating opportunities for women to find their voice, see beliefs that hold them back and develop the skills to create the life they dream about. “How did Compounding Courage get started?” asked Schmelz. Stephenson and Thousand saw the impacts of courage in their own lives after learning and discussing the research of Brene Brown. Stephenson even reached out to Brown’s team in Texas to to try to get them to come to the area for a discussion but it didn’t work out. That’s when they knew they had to be grassroots about courage here. Thousand talked about her feelings of thinking she needed to check all of her baggage at the door when she walked into work. “I thought that as a manager I always needed to keep my composure so that my staff wouldn’t know that I was struggling with something in my personal life.” This all hit home when Thousand’s mother-in-law passed away and no one from work attended the services because she realized she never talked about it. She didn’t want to burden her staff with talking about what was going through so they had no idea.